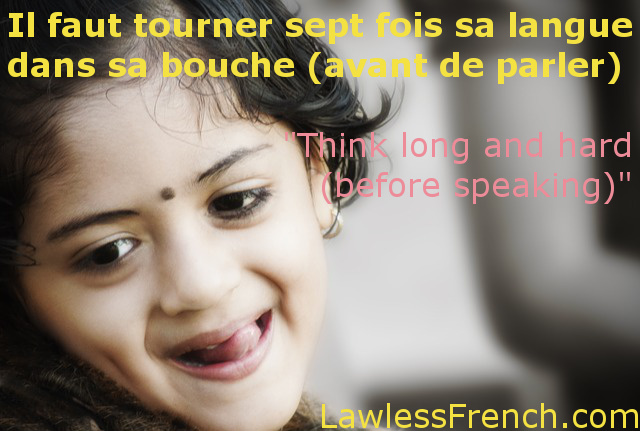 Usage notes: The French proverb Il faut tourner sept fois sa langue dans sa bouche avant de parler offers advice akin to "you should think [long and hard] before you speak" or "you should count to ten before speaking." The idea is that taking the time to do seven tongue rotations gives you ample opportunity to think about what you really want and mean to say. The English expression "hold your tongue" is somewhat similar, but orders you not to say anything at all, rather than just advising you to choose your words carefully. Élise est très sensible, il faut tourner sept fois sa langue dans sa bouche avant de lui parler. Élise is very sensitive, you have to count to ten before talking to her (to make sure it’s not something potentially offensive). Tu es sur un terrain glissant – tourne sept fois ta langue dans ta bouche avant de répondre. You’re on thin ice – think long and hard before you respond.